Final from Salt Lake City: Utah 110 Bulls 102 (Bulls 10-33, 5-17 on the road). LEADING SCORERS: Bulls: LaVine: 21points. Utah : Mitchell: 34 points. LEADING REBOUNDERS: Bulls: Carter Jr. 9. Utah: Gobert : 16. 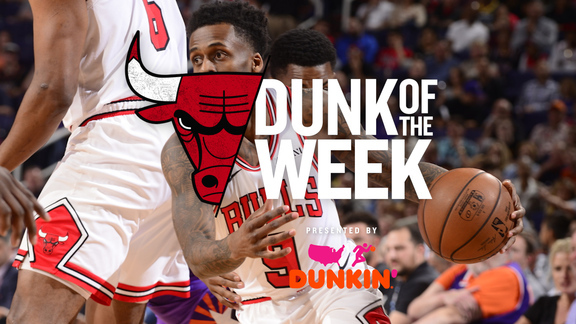 LEADING ASSISTS: Bulls: Dunn: 8. Utah : Gobert : 8. CCI Recap: The Bulls played the Jazz tough but hit a five minute stretch in the fourth quarter that saw them get out scored 17-3 . That was the turning point as Donovan Mitchell seized the moment recording his third straight game of 30+ points. Rudy Gobert was fabulous with 15-16-8 and 2 of Utah’s 11 blocks. Another key stat - 3 point field goals: Utah 16 Bulls 7. The Bulls bench tallied 37 points with Jabari Parker and Wayne Selden each scoring 11. Kris Dunn played a solid game 10-5-8, 3 steals and 2 blocks. Bobby Portis missed the game with a right elbow injury. Up next: At Los Angeles Lakers on Tuesday. Detroit 109 - Los Angeles Clippers 104. Blake Griffin returned to Staples for the first time facing his old team and responded with a 44-8-5 game. Andre Drummond had his seventh 20-20 game of the season. Griffin is in the first year of a five year 171 million dollar contract signed while playing for LAC. Miami 112 - Memphis 108. Justine Winslow scored 26 points.. he is ballin. Dwayne Wade with a big time block on Shelvin Mack with four seconds left. Orlando 105 - Boston 103. Terrence Ross was in the zone with 25 points- 18 in the second half. The Magic snap a four game losing streak. Minnesota 110 - New Orleans 106. KAT with a career high 27 rebounds; toss in 27 points. Anthony Davis had 30 points and 14 rebounds - his 13th consecutive double-double. Oklahoma City - 122 San Antonio 112. Dennis Schroeder scored 19 - all coming in the second half. OKC’s bench totaled 49 points. LaMarcus Aldridge who scored 56 points against the Thunder on Thursday was held to 17. Sacramento 104 - Charlotte 97. The Hornets dropped to 2-11 against Western Conference teams. The Kings are 10-3 against the East. Willie Cayley-Stein registered his second straight double-double.